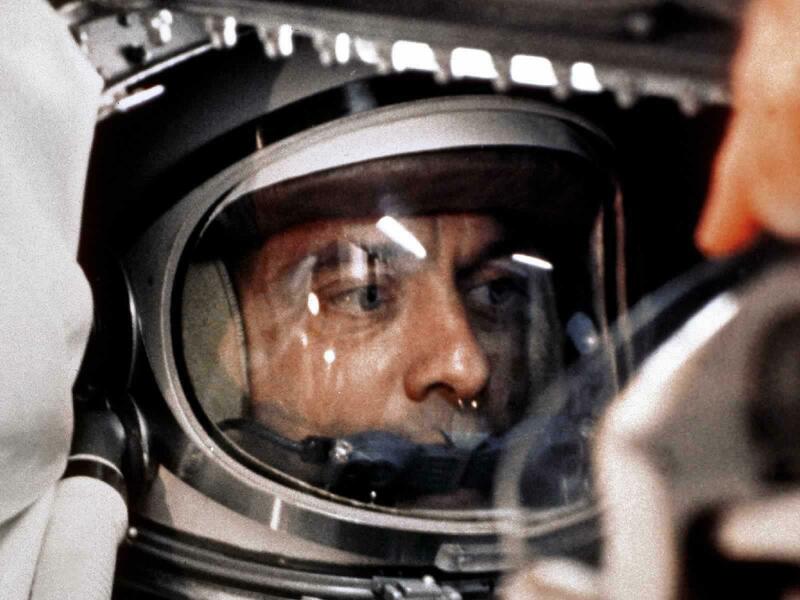 To commemorate the fiftieth anniversary of NASA’s Freedom 7 mission, which saw Alan Shepard become the ‘First Man in the Free World’ to take a ride on the end of a rocket, I will be presenting the lecture ‘Living in Space’ at the ICA in London on May 5. Taking place fifty years to the day when Shepard made his short – if heroic – ascent, my talk will be concerned with biological time, architecture and technology. Consider it a counterpart to ‘Radiant Static’, my recent talk on Yuri Gagarin at Club Integral. This time my words will also be accompanied by the sublime radiophonic tones of The Asterism on dials, wires and bleeps. It should be quite an event. No rocket ever survives its entry into space. It becomes consumed instead, dismantling itself in carefully timed stages, disintegrating and dispersing in an excess of energy, waste and debris: a brief moment of industrialized ecstasy. Then it falls away into uselessness.The desire to build a rocket positions you in both time and space. A trawl through NASA planning documents dating from the Moon landing onwards reveals the forced pace of progress: a manned landing Mars by 1982, a functioning Lunar base by 1995. Meanwhile gravity holds you in place. Space exploration reads too much like a history lesson these days: we’re already haunted by it, forgetting specific details, glossing over events. ‘Isn’t it better to talk about the relative merits of washing machines than the relative strengths of rockets?’ Richard Nixon asked Soviet premier Nikita Khrushchev during their televised ‘kitchen debate’ back in 1959, without a single housewife in sight. Call it progress if you will. A featured part of the Strange Attractor Salon currently in residence at the ICA, the talk will start at 7.00 pm and will be followed by a screening of Larry Cohen’s The Stuff. Tickets for the talk and the film can be bought separately at £5.00 apiece, or you can pay £8.00 and see both my talk and Cohen’s barf-tastic masterpiece in one package – although I do not recommend trying to take in both at the same time. Pictured above: Alan Shepard – doing it for the Free World. 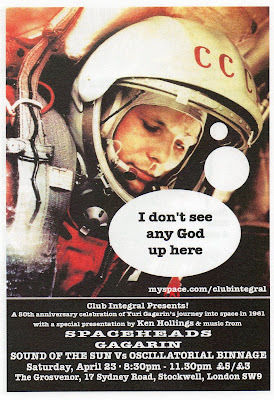 Anyone remaining in London over the spring festivities may like to know that I am giving a short talk about Yuri Gagarin on the eve of Easter Sunday as part of ‘I Don’t See Any God Up Here’, an event organized by Club Integral at the Grosvenor in SW9. Other participants include Space Heads, Gagarin and Oscillatorial Binnage vs. Sound of the Sun. All the relevant details are included on the flyer reproduced above or can be accessed by clicking here. It seems entirely appropriate to stage a memorial to the great achievement of Yuri Gagarin as part of the mystery of Easter rather than another instalment in the series of hearty celebrations officially held on Cosmonaut’s Day. The truth is that we don’t want our cosmonauts and astronauts back in our lives – they are too painful a reminder of technological as well as spiritual failure, just one more indication that we are trapped down here on this cop-ridden planet, beset by the sins of materiality and so terribly afraid that there will be no resurrection. Gagarin’s claim not to have seen God while orbiting the Earth is not, therefore, the cheery expression of faith in progressive humanism but an echo of the dark despair of a redeemer, abandoned in Hell, giving up all hope of a new dawn. Have a Happy Easter. Please join us for a night of transcendence, otherness and bliss at the ICA on Friday 15 April for our Strange Attractor music night, Weirding Modules, from 7pm. The full Amal Gamal Ensemble line up, this heavy kosmische supergroup being the nearest you’ll get to seeing Tangerine Dream circa 1969 anywhere without a functioning time machine. And Raagnagrok, who were in fine fettle last weekend in Canterbury and will be joined once again by Andy Letcher of Telling the Bees on breton pipes and, for the first time anywhere, the brilliant Paul May on drums and exhibiting artist Nathaniel Mellors on bass. 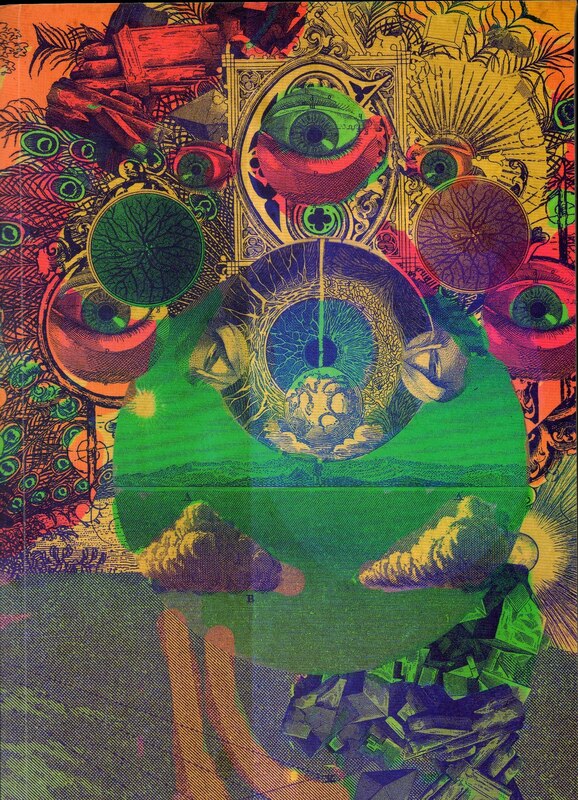 Frances Morgan doubles up on the decks, joined by the mighty Matt ‘Woebot’ Ingram, for obscure gems from the akashic jukebox. Looking forward to seeing you there! Booking details for the event can be found in cyberspace by putting your cursor here and briskly clicking a couple of times. A PDF of the contents pages for Strange Attractor Journal Four can be found by doing the same thing here; and full ordering information for the volume can be found by opening a portal here. 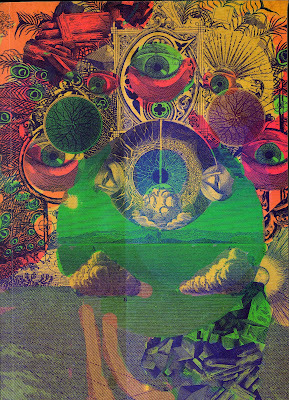 Pictured above: Strange Attractor Four front cover, ‘Peacock Angels’ by Julian House - tenebrae fiunt. You will see that I have been keeping strange company of late: first giving a brief talk on the connections between Ludwig II, Elvis Presley and Michael Jackson at ‘Pretty – Ugly’ as part of my continuing research into the psychoanalysis of trash and then appearing in the latest edition of BBC Radio 4’s ‘File on Four’ series. Presented by photographer, filmmaker and broadcaster Toby Amies, ‘How to Archive Yourself’ is a leisurely stroll through people’s attempts to document experience and what happens to such memories after they migrate online – other contributors to this fascinating show include Microsoft’s Gordon Bell, ‘the Frank Lloyd Wright of computers’, and (no, really – say it isn’t so) Robert Fripp of King Crimson. The conversation – I really would hate to call anything that relaxed an ‘interview’ – ended up being a freewheeling and extremely stimulating affair, right down to me complaining about the amount of digital documentation that regularly takes place at conferences, panels and festivals but then never turns up online – except maybe months afterwards, wrongly tagged or accompanied by incorrect or misleading information. I wasn’t sure what Toby and producer Sara Jane Hall were going to make of the whole thing – but the resulting show turns out to have considerable informality and charm. ‘How to Archive Yourself’ will be available on i-Player for the rest of this week and can be accessed by clicking here. Pictured above: KH discourses on the Psychoanalysis of Trash at ‘Pretty – Ugly’, photos courtesy of roving shutterbug Kitty Keen. The title Pretty―Ugly is a casual phrase imbued with a range of subtexts: aesthetics and anti-aesthetics, desire and repulsion, interest and disinterest, surface and essence, polish and sincerity. In a sentence: we are interested in exploring a ‘naïve’ aesthetic as it is created by very aware, professional designers. Through our workshops, exhibition, series of talks and our auction, we hope to raise a critical discussion on the subject of contemporary ‘undesign’. The talks are scheduled to take place within 6.00 pm and 7.00 pm – there is also an exhibition, and a publication will be available on the night. My presentation will take the form of a brief return to, and reflection upon, ‘The Psychoanalysis of Trash’, one of the lectures I gave as part of Neville Brody’s Anti-Design Festival last year. Some of the notes for the talk are reproduced in the Pretty – Ugly publication. In the meantime, a video of my Anti-Design Festival lecture on trash has been posted on Vimeo by Ignite Creative TV – overall, the footage looks pretty good, although the opening title identifying me as Jennifer Walshe probably doesn’t speak too highly for the company’s post-production skills. In what turned out to be an appropriate conclusion to Requiem for the Network, my series of talks for Radio 3 last week, I had an opportunity to pay tribute to the design genius of Paul Baran. Talking with Paul about his experiences at the RAND Corporation during the 1960s for my R3 feature All Your Tomorrows Today provided not only one of the highpoints of that particular show but also one of my fondest memories of working in radio to date. I am pleased to say that you can hear extracts from that original conversation intercut with my own commentary on Paul’s remarkable career in a sequence from the April 1 edition of Radio 4’s regular broadcast obituary The Last Word. The piece sticks pretty closely to the story of Baran’s development of the distributed network, the basic conceptual architecture of the internet, but also gives some sense of the man and his relationship to the Cold War world of strategic thinking. My favourite moment in the original interview was when he revealed that his papers on distributed communication were translated into Russian so that the Soviets could have easy access to them: ‘We wanted them to have that information,’ he explained. ‘Their communication systems were even worse than ours.’ His tremendous work at the Institute for the Future, the think tank which he cofounded in 1968 with Jacques Vallée and Olaf Helmer is yet to be fully assessed – but then it’s still a going concern, as my friend David Pescovitz told me in a recent conversation which we recorded together for broadcast on Resonance 104.4 FM sometime later this year. Paul Baran will be greatly missed. The future may well go on without him – but it won’t be same. The edition of The Last Word featuring Paul Baran is currently available on i-Player and can be accessed by clicking here. It also comes as a podcast and can be found here. This feature should stay up online for about a month - but you can never tell theses days. 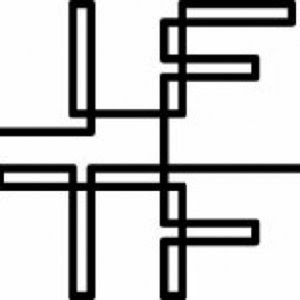 Pictured above: the Institute for the Future logo – where you and I are going to spend the rest of our lives. I recently had the pleasure of spending an intriguing afternoon with EVP researcher and recording artist Michael Esposito at the amazing studio of the composer Aleksander Kolkowski. Regular readers of this blog may recall that Michael was responsible with Carl Michael von Hausswolff for issuing The Ghosts of Effingham: a set of EVP recordings inscribed onto an Edison wax cylinder which also glowed in the dark. An enthused researcher of the machine's ability to reproduce sound, Aleksander’s creations include Mechanical Landscape with Bird – an extraordinary work for canaries, ‘serinette’, cylinder players and string quartet playing Stroh violins, Stroh viola and Stroh ‘Japanese Fiddle’. His work has also been featured in The Wire. On a visit to London from his home in Chicago, Michael had already made an arrangement with Aleks to run an EVP recording session at the studio, which is an Aladdin’s cave of working cylinder players, amplifying horns for gramophones and radios, antique musical instruments, sheet music, pictures and shelves full of books and old recordings. You can get some idea of the fabulous clutter in the photographs above – although I will be posting some more detailed glimpses of the studio contents on the Found 0bjects blog in the next day or so. But first the Edison machine itself had to be warmed up: I practised my short reading while Aleks switched on a lamp over the cylinder, set it spinning and waited for the wax to soften before a recording could take place. It had never occurred to me that the voice was inscribed into a soft substance – I always had an idea of it being carved out of something brittle and hard. 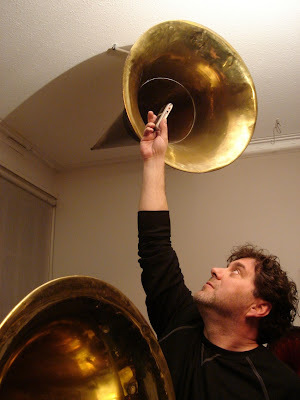 My second misconception was over how to approach a horn rather than a microphone. Working with mikes, you want to keep your face back from it in order to avoid popping and paper rustling – and after two days of recording my recent Essay series for Radio 3, I was more aware of that than ever. Instead Aleks was constantly instructing to get my face as far into the horn as possible while still being able to read from the copy of Welcome to Mars I had brought with me – images of Jean Cocteau leaning forward reciting poetry into the elaborate horn megaphone in production stills for Les Mariés de la tour Eiffel filled my head as I struggled to keep the page in focus out of the corner of my right eye and read out loud at the same time. Aleksander had also stipulated that I would have to speak very slowly and very clearly and enunciate every last syllable. The device, it turns out, really does have formality built into it: you find yourself addressing it, rather than some unseen audience. We recorded a two-minute cylinder, waited for it to cool down and then played it back on a separate machine mounted with a massive horn. I have never heard my voice sounding like that before – normally I cannot bear to hear it, but the grain that a cylinder recording brings introduces to your words makes them sound completely different – ‘other’. It does not copy, simulate or even echo you; it is a separate entity – something that comes from the machine and only from the machine. The clicks and pops formed an unexpected accompaniment to my delivery – I was enthralled by the whole thing. Michael had been taking photographs all the way through my reading and added the occasional encouraging smile and thumbs-up sign as it unfolded. Aleksander was also pleased with the way the reading came out – and at some point it’s going to form part of an online archive of recordings featuring many different composers, writers and musicians. There will, of course, be more on this project posted here as and when information becomes available. Right now, however, it was time for Michael to prepare the room for his extraordinary EVP session. What happened next, however, really deserves a post of its own – and I shall be only too happy to supply you with it … soon. Pictured above: KH recording an extract from ‘1947: Rebuilding Lemuria’, the first chapter of Welcome to Mars, pp 4-5, with Aleksander Kolkowski busy at the Edison phonograph: all photos taken by Michael Esposito.